Mrs. L.D.I.H.T.C.A.I.A.B.S.C.T.O.T.L.G. Leeks probably hopes she does not get any monogrammed towels for her wedding. Recently, Austin Kettle, 26, of Ipswich, Suffolk (UK) booked her honeymoon travel arrangements with the Thomas Cook travel agents. Without considering passport issues, she booked the flight to Gambia using her soon-to-be married name, Leeks. After booking the flight, Kettle realized that she would not be able to change the name on her passport until after the wedding. So, she called Thomas Cook and asked to change the name on her booking. 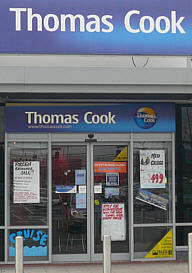 Following policy, the Thomas Cook company informed Kettle that she would have to pay a fee in order to make the change. This made her very unhappy. Mrs. Leeks said, "My fiancé thinks I’m crazy. The amusing thing is he will have to say my new name during the wedding ceremony."